Big Bear Ranch – In harmony with nature. Your health should be the main reason to eat grass fed beef, lamb or pasture raised pork and poultry. By choosing our products you do not only choose meat products that are healthy for you, but you also support a family farm with a variety of animals all sustainably and humanly raised in a natural, low stress environment. For your convenience we personally deliver monthly to the Lower Mainland and also to the Okanagan and Prince George. Please contact us by email, phone or fax to arrange for a delivery of our meat products. 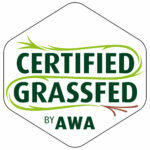 The Big Bear Ranch is certified by AWA (Animal Welfare Approved).